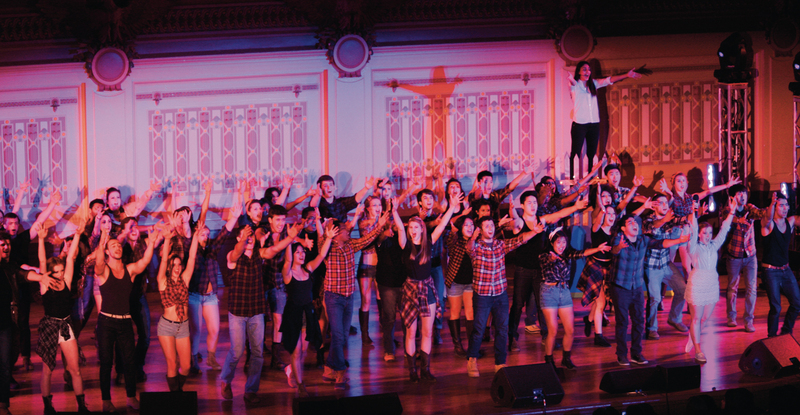 Greek Sing, Carnegie Mellon’s largest student-organized philanthropic event, took place last Saturday at Soldiers & Sailors Memorial Hall. The event raised over $90,000 for The Children’s Institute, the organization that Greek Sing has partnered with the past four years and for which they have raised over $250,000 in total. The performances ranged from self-aware comic skits to professional and precise Broadway-style productions, but all were brimming with an energy and enthusiasm that was palpable throughout the auditorium. The evening was broken into a singles category, one Greek organization performing alone; and a doubles category, a fraternity and a sorority performing together. The singles performances were much more relaxed and fun, with the precision and professionalism of the doubles all showing teams who came to win. The singles also contained much more original content — which helped add to the fun atmosphere — with the doubles almost exclusively adapting major musicals. Standouts from the singles category included a hilarious musical adaptation of the hit television show, Archer, titled Sterling: The Musical, which ended up taking third place in the singles category. Featuring fifth-year chemical engineering major Jason Kelso as the too-suave-for-his-own-good Archer, the production was true to the off-kilter comedic spirit of the show and was packed with hilarious punch lines and songs. Sigma Alpha Epsilon’s original show A Shrub’s Life, which ended up taking home second place in the singles category, was equally entertaining, with botanical puns galore and a laid-back attitude that made it clear the cast was there to have fun. The energy permeated the auditorium, leading to many missed jokes due to overwhelming laughter. The productions of the doubles category were packed with all sorts of shiny bells and whistles. The months of work that went into Greek Sing was evident in many of these performances, with complex choreography ripped right from Broadway and intricately designed sets and costumes. Standouts from this category included Pi Kappa Alpha and Kappa Alpha Theta performing a Carnegie Mellon-themed adaption of the hit 1950s musical Grease, for which they won second place. The production was incredibly engaging, with great dancing, costumes, and numerous Carnegie Mellon references — such as turning the “greased lightning” car into a buggy and a set that included a painted fence saying “Spring Carnival 1959” — that the audience loved. The most entertaining doubles performance, and the one that was awarded first prize for the category, was Lambda Phi Epsilon and Alpha Kappa Delta Phi’s adaptation of the Disney musical Mulan. Featuring stunning costumes, a great set, energetic performances by all members of the cast, and most importantly, original jokes that were written into the script to give it the individual, fun spirit that many of the other doubles were lacking, the performance was delightful. Greek Sing 2014 was another great installment of an event that raises an enormous amount of money for a worthy charity. It’s also a great way for many members of the Greek community to show off the talents that many wouldn’t expect them to have, such as singing and dancing or writing a great script. Hopefully next year there is a greater push for original content, for it is in these performances that the spirit of the event was its best.